Exactly 10 years ago today, terror struck the heart of New York City. Today we remember the events of September 11, 2001 a Decade Later. It wasn’t just New York City that was attacked, The Pentagon in Arlington, Virginia was also attacked. And a third site was in Shanksville, Pennsylvania where another plane crashed before reaching its target, Washington, D.C.
We finished the rest of the class as if nothing happened. When I got out to get to my next class, I saw parents by the main office. They have come to take their kids home. I walk into my math class and a few minutes in, an announcement by the principal comes in which states that school has been dismissed. Then I thought to myself, maybe something did happen. Public transportation worked fine, so I took the bus home. I came home and looked out my 11th floor window in Queens and I had a clear view of the Twin Towers from my room, but they weren’t there. They were replaced by a huge pillar of smoke that covered a lot of the sky. I turned on the TV and there it was. The news was covering the attack on the Twin Towers earlier that morning. I looked out the window again and I couldn’t believe my eyes. I always enjoyed looking out my window and being able to see the Twin Towers as well as the Empire State Building and the Chrysler Tower almost side by side. And now, my view was cut in half. My little sister was also dismissed early. My mom took the rest of the day off work and brought my sister home. Neither of them could believe their eyes either. There was so much death and destruction, it felt as if it was a movie. We received calls from our families all over the world asking if we were OK. I was fortunate enough not to have lost any family members, but I did know people who have lost family. Almost 3,000 people died in the attacks. It was the worst event I have ever witnessed and it’s something that I will never forget. Ten years ago today, terrorists shook our nation. New York City took it the hardest when lower Manhattan was basically destroyed. We have been recovering over the past decade and today, Lower Manhattan is flourishing with new Hotels, Buildings, and new Businesses. Today we look back at the horrific events of 9/11 and we remember everyone that has been lost. 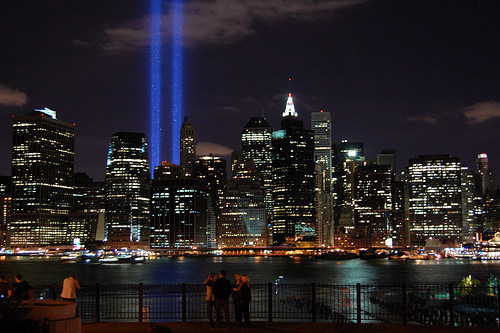 The two pictures in this post show you the lights at the World Trade Center site around the anniversary of the event. 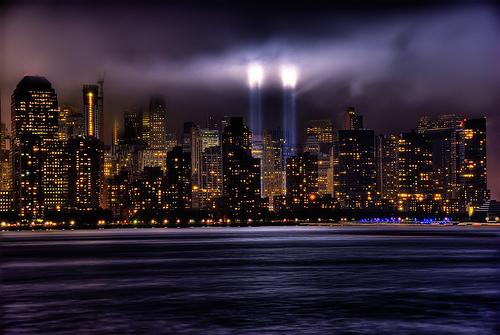 Even though I can no longer see the Twin Towers, I can still see their essence through the lights every year. And sometimes, I look out the window just wishing that everything was just a nightmare and the Towers were back where they originally were. The events of 9/11 has made our nation stronger in every way. Ten years later, we feel safer than ever before through all the policies and laws that have been put in action. Although many of them may be inconvenient, they do their job for the most part and keep us protected. And Osama Bin Laden is dead which gives us another reason to feel safer. I think it would be much better if our troops were back home with us now, but it’s just my opinion. I know there have been many videos and articles about conspiracy theories surrounding the 9/11 attacks. Conspiracy or not, the event still occurred and thousands of people died. We should remember the event and bond together to make the country stronger. This is also an event that we should never forget. We need future generations to know and understand what we have gone through so they can learn from our mistakes, whether it’s through national security measures or just by knowing that we can’t get anywhere with violence and destruction. Today is September 11, 2011. Ten years ago tragedy struck our world. Today we honor all the innocents who have lost their lives by remembering them. Today we look at the faults of human beings and we learn that violence gets us nowhere. Today we remember 9/11, an event we will never forget. Feel free to share your own thoughts of the event like where you were during the attacks and if you were personally affected by the event. The two images posted in this article follows the creative commons license. The same does not go for this article as a whole.